Note: since I first published this post, I have changed the title. This used to be called “Adventures With Autocorrect”. This is the same post, just with a different title and bigger pictures. Is the thing that we always refer to as “autocorrect” actually the right term for it? Correcting something means fixing a mistake; when we’re typing something out and haven’t finished, we haven’t made a mistake yet. Often the mistake is made for us, thereby contradicting the term. Personally, I like to refer to it as “autocomplete” as it’s not correcting our words after we’ve typed them, it’s offering options to complete them for us. Often it’s suggesting everything except the word we’re actually looking for, but that’s a whole other can of worms. Predictive text. That’s a more accurate description of what it actually does; it tries to predict what we’re going to type and it gives suggestions to speed things along. 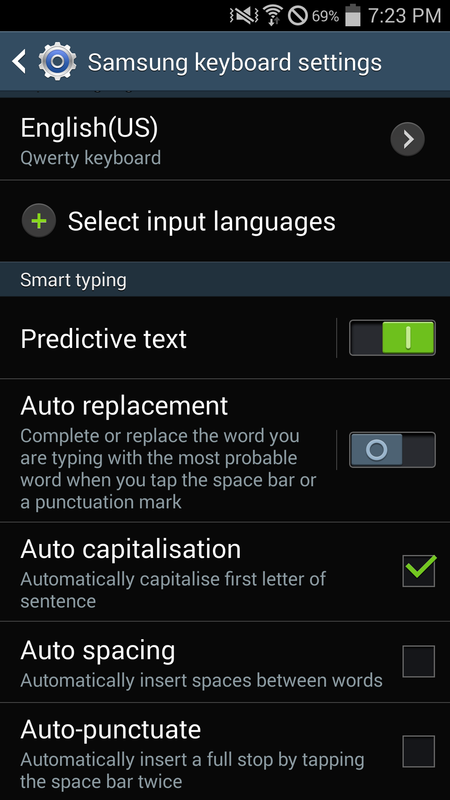 It’s also sometimes referred to as “text replacement”. We have all experienced the frustration of trying to type something out, only to have the word replaced with something completely different from what we intended. Normally, I don’t have any problems like that on my phone, but I did run into it recently. 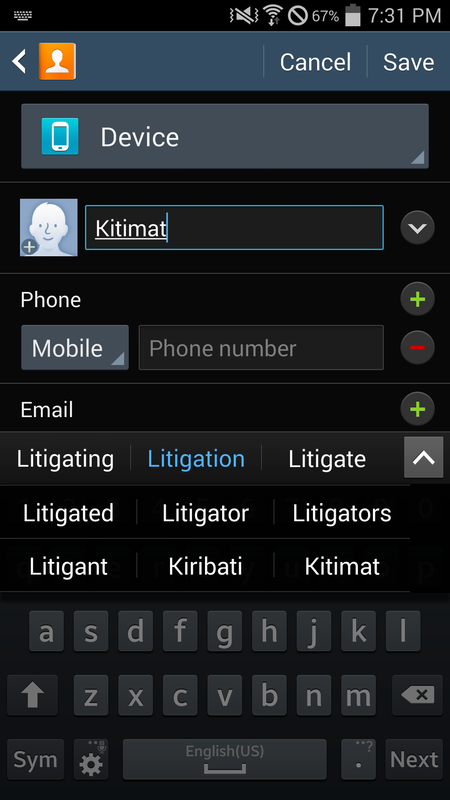 It was suggesting I replace “Kitimat” with “Litigation” or “Kiribati”, among other words that aren’t even close. How it came up with either of those is beyond me. Orginally, I was able to type “Kitimat” without any problems, but when I tried to enter it for another contact, it slipped in “Litigation” without me noticing it. Later, I went looking for a contact starting with “Kitimat” and couldn’t find it. I found it further down, where the first word was “Litigation”, which is not what I typed. How rude. “Kitimat” is a problematic word as it’s never recognized as a proper name. It’s either victim of autocompletion or it gets underlined in that jagged red line of death in word processing software. It can’t be replaced, though. It is the name of my home town, not a court action or a group of islands in the middle of the Pacific Ocean. Another odd suggestion came up when I was trying to save the number for my dentist. His name is Dr. Gottschling and the autocomplete came up with “Gotta cling.” Yeah, I’m going to make an appointment with Dr. Gotta Cling, I’ll get right on that. Anyway, I changed the settings on my phone so that it still offers suggestions, but it doesn’t automatically insert them. I can chose to use one of the suggestions, I can choose not to. Most of the time, I’ll be choosing not to. This entry was posted in Uncategorized and tagged autocomplete, autocorrect, smartphones, text replacement. Bookmark the permalink.